Kaiju Candy has done it once again with the release of her original IT themed range of brooches and earrings. 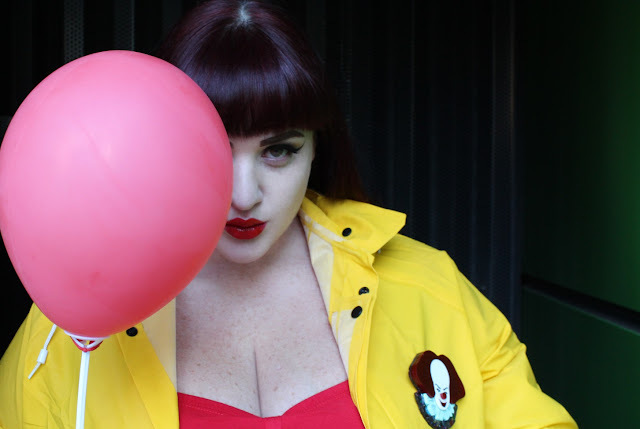 Donna the master of making all things horror wearable has created 4 bold and brilliant pieces to pay homage to one of the scariest characters in horror history. Stephen King's IT was one of the most terrifying and long term fear inducing films/mini series of my generations youth. Shaping young horror lovers like myself or scaring the crap out of your with Tim Curry's brilliant partial of Pennywise. Many of the most iconic books turned film were big when I was a child and preteen so I've basically grown up reading and watching his stories, so obviously owning this set was a must. From the moment I saw the sneaky previews for this amazing Pennywise brooch I knew he must be mine but until I held him in my hands I had no idea of the sheer brilliance and size of this clown bust. Donna of Kaiju Candy always created the most perfect accessories because she knows exactly how to mix patterns, shapes and multiple forms of glitter. I think the theme for every spooky themed shoot I do for Kaiju Candy should be - Getting my creep on for Donna. Just look at that pop and sparkle! How can you not wear these pieces each and every day. Styling wise it's super simple. Currently I'm loving them paired with bold red blouses or my Troublemaker and Bad Girl Crop Tops from Vixen by Micheline Pitt. 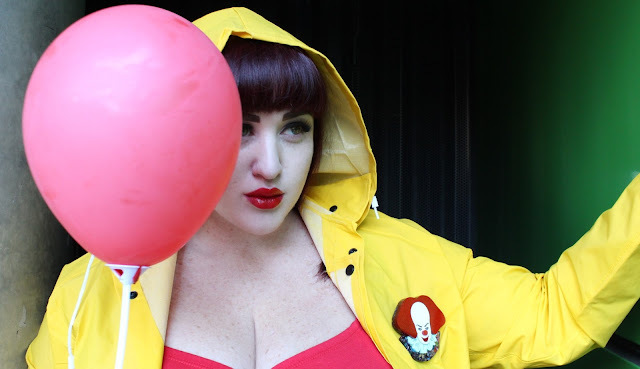 Obviously I could not help but get inspired by these pieces and created my own little homage to the film with a Georgie style rain coat and balloon which I picked up at Bunnings. Just a little creepy and kooky and hey I think I've got at least one of my Halloween week looks sorted! Many thanks to my amazing husband for stepping up and snapping these for me! We learn more and more every shoot and it's always awesome to create with him.